One tequila, two tequila, three tequila, MORE! Bar Crawl de Mayo is back for another year, giving Chicago the opportunity to blissfully throw back a few drinks with friends, and even make new ones on the way! Get out to the best bars in River North to celebrate! WHAT'S INCLUDED: Tickets include Admission, a T-Shirt , a Brunch Buffet, three $4 Gift Cards to Use on the Crawl, Giveaways & MORE! PRE-PARTY: Join us at Public House on Friday, May 3rd. Mention that you are there for "Bar Crawl de Mayo" at the host stand between 9pm and 1am to receive a drink ticket on us! AFTER-PARTY: Join us at Moe's Cantina River North on Saturday, May 4th. Mention that you are there for "Bar Crawl de Mayo" at the host stand between 10pm and 11pm to receive a drink on us! WHY: Friends, beers, drinks, fun, etc. etc.....also, why not?! CRAWL SCHEDULE/T-SHIRT & PACKET PICK-UP INFO: The crawl schedule and T-Shirt/Packet pick-up info will be announced on Friday, May 3rd in the afternoon, please check back for details! You will select your T-Shirt size when you pick up your shirt & packet. We will have small, medium, large & extra large shirts available and they will be given out on a first come first serve basis. -Fundraising Opportunity: Are you trying to raise money for a certain cause? 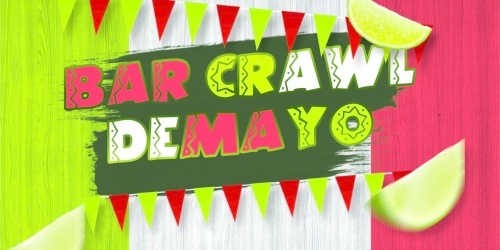 Email Info@BarCrawlDeMayo.com for more info! -Want to earn a free ticket and some cash for spreading the word? Email Info@BarCrawlDeMayo.com for more info! Nestled above Old Crow Smokehouse in River North, Chicago's newest premier lounge, Tunnel, opens its doors in February 2015. As the name suggests, the nondescript entrance on Kinzie Street opens to a hidden covered staircase inspired by London’s infamous urban tunnels. Blending the allure of a high-energy nightlife experience with VIP treatment, Tunnel aims to transform its venue on a nightly basis into a unique scene. As you climb each step, you begin to wonder what adventure awaits you upstairs.